When visitors come to Southern Arkansas University for the holiday season this year, the campus’s landmark Bell Tower will once again be ringing. The Bell Tower was constructed in 1976 as a water tower for the campus, and until recently, it held 50,000 gallons of water. The addition of a water tower by the city of Magnolia near the SAU campus eliminated the need for the SAU tower. In 1980, then-SAU president Dr. Harold Brinson purchased the set of 14 bells to begin ringing every quarter hour. The bells were purchased with funds from the University’s first alumni telephone campaign. Time and lightning strikes damaged the original mechanism, making it unreliable, and the tower has been silent for several years. To bring the Bell Tower’s sound back to the campus, the University will install new digital operating equipment that will provide a variety of options including chimes and music. The work will be done with funds from an $18,475 gift through the SAU Foundation. The donation was made through a partnership of Julia Laney Machen, a member of the SAU Foundation Board of Governors, and members of the Phi Lambda Chi Fraternity. Machen began the campaign to restore the bells in memory of her late husband, Billy Ray Machen, who was the physical plant director at SAU when the tower was constructed. 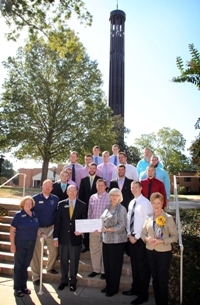 Looking for a project that would contribute to the SAU campus, the members of Phi Lambda Chi chose to help complete the necessary funding to bring the bells back into operation. Machen said her late husband was a technology guru, so the addition of a new digital mechanism would please him. Will Bowling, president of the Phi Lambda Chi Alumni Association, said the fraternity’s involvement included active members on campus as well as alumni. “We completed our first scholarship endowment at homecoming last year, and we made a decision then to raise money for a project on a yearly basis,” he said.